We are manufacturer and supplier of Safety Harnes, Safety Belts, Safety shoes, Safety Helmet, safety Jacket , safety goggles, safety mask, safety industrial safety shoes, safety net , construction safety net , ISI mark Ce marked safety items ppe we have Safari Pro safety shoes , Tiger safety shoes, Allen cooper safety shoes to various cities like Delhi, Noida, Ghaziabad,Mumbai, ahmedabad, chennai, bangalore, Faridabad, Gurgaon, Sonipat, Ambala, Karnal, Bhiwadi, Neemrana, Bulandshahr, Kanpur, Lucknow, Varanasi, Allahabad, Dehradun, Haridwar, Chandigarh, Shimala, Panchkula, Ludhaiana, Gwalior, Jhansi, Agra, jaipur, Nagpur,Sholapur, hosur and many more. 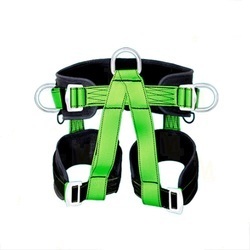 We gained recognition in offering a wide variety of Sit Harness Belt to our clients. Our organization is eminent name in offering a broad array of Full Body Harness Belt to our clients. 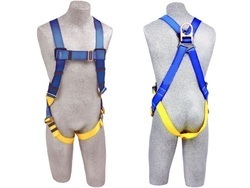 We have Wide range in Safety Half Body Harness. Available in Noida Delhi and Delhi NCR. Backed with a team of skilled professionals, we are willingly engaged in offering an encompassing spectrum of Multi purposeHarness Belt to the clients.